She was an unlikely candidate for literary success. Raped at age seven by her mother’s boyfriend; mute for years afterward; a single mother at 17; a performer at a strip joint and operator of a brothel. Marguerite Johnson could easily have slid into nameless, faceless poverty, part of the neighborhoods and communities many of us ignore while driving to and from work, major league sports events, or cultural attractions. But she reinvented herself, not once but many times. She went on stage as a singer and actress. She changed her name. She became involved with the civil rights movement. She knew Martin Luther King, Coretta Scott King, and Malcolm X. She reinvented herself again with a memoir in 1969, one that turned her into an eminence in the literary world, I Know Why the Caged Bird Sings. In 1993, the little girl who was raped in a poor neighborhood in St. Louis would stand on the steps of the U.S. Capitol and recite a poem, “On the Pulse of Morning, ” for President Bill Clinton’s inauguration. “Words mean more than what is set down on paper, ” she said. “It takes the human voice to infuse them with deeper meaning.” Listen to the meaning in that reading on the Capitol steps. I was an executive speechwriter at the time of President Clinton’s first inauguration, and I paid attention to the speeches made that day. But not like I paid attention to that poem. Maya Angelou was a remarkable woman, poet, writer, speaker, actress. And in many ways, she was the quintessential American. We Americans reinvent ourselves. That’s why we came to North America to begin with—to reinvent ourselves, escape the old, find ourselves again or create new selves. Sometimes, as in the case of millions of Black Americans, we were forced to come—and in spite of that, we still reinvented ourselves. “There is no agony like bearing an untold story inside of you, ” Angelou once said. And she released those agonies, many times. She told her stories, and in the process on the telling, her stories became our stories. 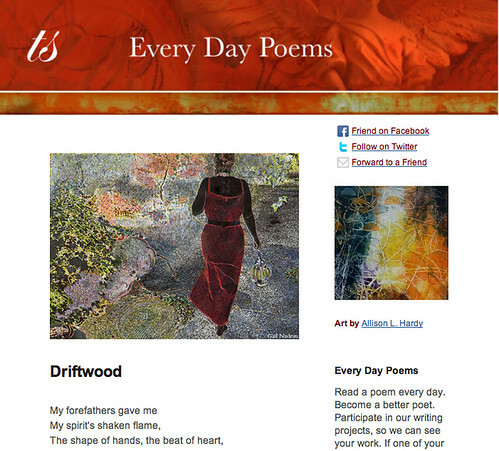 Maya Angelou’s poetry has fused into American poetry, changing both and reinventing both. In her life, she escaped the cage, and went on to sing of freedom. Image by Rem-Zel. Sourced via Flickr. Post by Glynn Young, author of the novels Dancing Priest and A Light Shining, and the recently published Poetry at Work (T. S. Poetry Press). All the barriers came down, all the boundaries were crossed, wherever Angelou appeared. She was phenomenal. Her voice will endure. what is renewing our mind?